Today’s poetry news round up takes a look at Wilfred Owens’ bugle, which has been played in public again. We also take a look at yet more artwork drawn by a poet that has been found after many years of being missing. 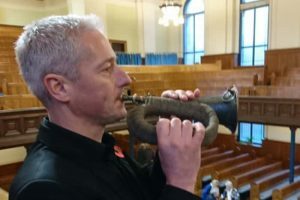 The bugle that belonged to Wilfred Owen, the First World War poet, has been played in public a second time. Owens took the bugle from a dead German soldier during World War One. He had been intending to give it to his brother, but he couldn’t part with it. The bugle is rather symbolic, and brings to mind “Strange meeting”, a poem by Owen in which a dead German soldier and a dead British soldier meet. The bugle was played for the first time in 100 years at the poet’s graveside in northern France, during a ceremony to mark the centenary of the poet’s death which occurred just one week before the end of the war. Owens’ family, who still own the bugle, have since given permission for it to be played at a Remembrance Service, when it was used to play a rendition of the Last Post. It has also been played in private at a dinner held in the Redford Barracks in Edinburgh. The playing of an instrument which had been silent for nearly 100 years was seen by many as a very fitting tribute to those who fell during the First World War. The bugle remains the property of Owens’ family and it is not known if, or when, it will be used again. 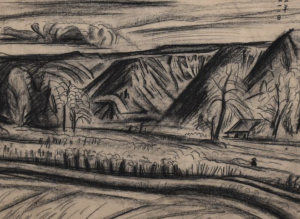 The discovery in Kyoto, Japan of two charcoal drawings has reignited an interest in the poet and painter Kaita Murayama. Kaita, who died at the age of just 22 of tubercular pneumonia, was considered a genius during his lifetime. These charcoal drawings which had been thought to have been lost for the last 100 years have recently been found during a clean-up of a storage room. Kaita began to show a real talent for both poetry and writing from a very early age. When he moved to Tokyo, he enrolled in an art institution and much of his work was exhibited there, gaining him numerous awards and also significant acclaim. The two lost drawings are titled “Shinshu Fukei” (Landscape of Shinshu), and are a representation of farmland bordered by the mountains during the season when the rice is harvested. They have been described as some of Kaita’s best work by an art expert. They are thought to be part of a series of images sketched by Kaita of the Shinshu area, and his diary entries indicate that he wanted to complete 50 drawings to complete the series. The last time that the drawings were seen in public was during a display that was mounted in 1919 to commemorate the artist’s death. Since the exhibition their location has been unknown until this recent discovery. The belief is that they were in fact purchased following the exhibition, possibly by one of Kaita’s classmates. They have surfaced again at a time when the artists death is nearing its centenary, something which is being seen as very symbolic.